Krispy Kreme was once a cult favorite company for both doughnut aficionados and investing junkies. But not any more. Shares of Krispy Kreme (KKD) plummeted 12% Thursday after the company reported sales and earnings that missed forecasts and gave an outlook that was, well, full of holes. The stock is now down more than 20% this year and hit its lowest level since May 2013. Why is the company doing so poorly? It's not because people are deciding to make healthier food choices. If that were the case, then shares of its chief rival Dunkin' Brands (DNKN) would not be up 12% so far in 2015. It appears that the main problem is that Krispy Kreme fans are only buying doughnuts at the company's actual stores. Sales of Krispy Kreme's consumer packaged goods business, i.e. Krispy Kreme-branded products at supermarkets and other retailers, have been soft. Making matters worse, CFO George Price Cooper said during the company's conference call with analysts that the return rates from Krispy Kreme's wholesale partners was higher than normal. Krispy Kreme, like competitors Dunkin' and Starbucks (SBUX), has tried to diversify beyond its core retail stores with products that people can buy elsewhere. This strategy doesn't seem to be working too well. One notable exception? The company said demand for Krispy Kreme K-Cups was healthy. That could be good news for struggling K-Cup maker Keurig (GMCR). But Krispy Kreme CEO Tony Thompson, who joined the company from Papa John's (PZZA) last year, said Krispy Kreme will focus more on opening new locations in the U.S. and internationally and less on the consumer products side of things. Krispy Kreme recently announced plans to open 10 stores in Myanmar, for example. Thompson said Krispy Kreme will also continue to de-emphasize gimmicky one-day sales promotions ... which can bring in lots of customers but hurt profits because of the huge discounts. Krispy Kreme is still planning to stick with its popular Talk Like a Pirate Day promotion though. On September 19, anybody who does their best Blackbeard impersonation will get a free doughnut. And if you feel like dressing up as Jack Sparrow or Captain Hook. 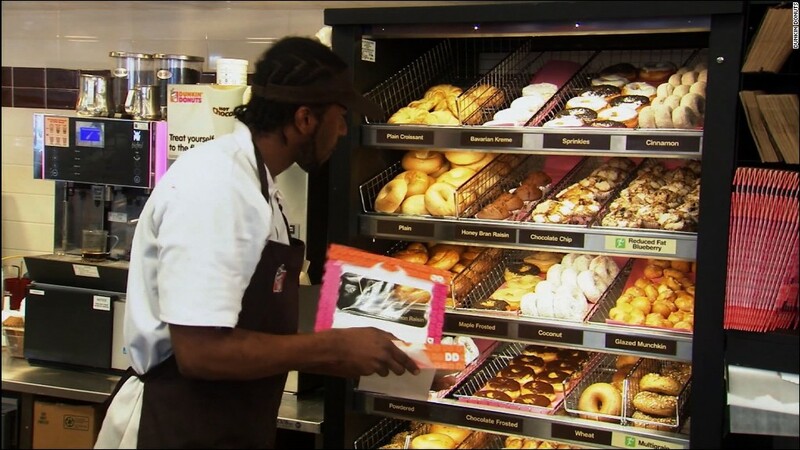 you'll get a dozen doughnuts free. Still, don't expect lots of these one-time events. Instead, Thompson said that Krispy Kreme is embracing the "limited time offering" seasonal model that Starbucks has made popular. In the early summer, Krispy Kreme sold what it dubbed Southern Classics: Lemon Kreme Cake and Peach Pie Doughnuts. Later in the summer, Krispy Kreme had Birthday Cake Chiller and Cake Batter Doughnuts to coincide with the chain's 78th birthday. Related: The PSL from Starbucks is back! Thompson said the best thing about these offerings is that Krispy Kreme has been able to charge higher prices for them. So expect more this fall. It just unveiled a new Salted Caramel Latte drink and doughnut. And like Starbucks, it also has a Pumpkin Spice Latte. But at the end of the day, Wall Street wants Krispy Kreme to focus on what it does best and not overextend itself with too many new products. And to show just how resistant to change some Krispy Kreme loyalists are, this was an actual question from an analyst to Thompson during the conference call. "Is Krispy Kreme credible to the consumer as a cruller instead of a doughnut?"